We are really, really proud of being the recipient of many awards and great reviews for our gaming pcs, from our first PC review in 2007, to NINE best buy awards and TWELVE five star reviews in the past couple of years alone beating some very stiff competition. What we like to see in a good gaming pc. 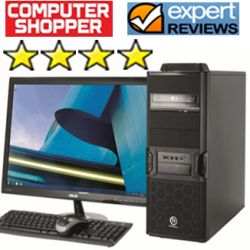 We have always tried to win every award we possibly can based on value for money, features and performance, it reflects well on us as a business, but most importantly it means our customers are getting the best deal which reflects in our pc reviews. This means: Quality CPU, we always try and squeeze in something more than expected in the price bracket, so getting an Ivybridge i5 overclock or an i7, give us optimum performance. Good GPU, like the CPU, we always try and squeeze something unexpected within the price bracket, so you are getting the optimum power for the best price that we can possibly make it. Extra Cool features, We have always tried to incorporate a large hard drive or SSD with a blu-ray drive or a fantastic monitor and keyboard/mouse set up. 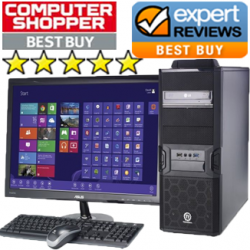 Expert Reviews/Computer Shopper said: Overclocked, great graphics, ample storage and great upgrade potential, this is a FANTASTIC PC” – 5 STARS. Are we the best place to buy a pc? 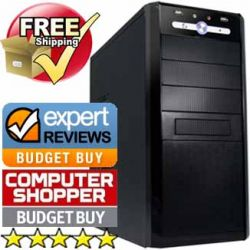 We certainly think we are the best place to buy a gaming pc, our goals are simple, give the best price and service to our customers which in turn will help us grow through happy recommendations, great reviews from pc magazines and a general satisfaction on our part, please give us a comment or like if you agree! (or not, we are always loving feedback!) We also want to use this small blog post just to thank our customers, friends, colleagues and reviewers for their ongoing support, we gladly appreciate it.